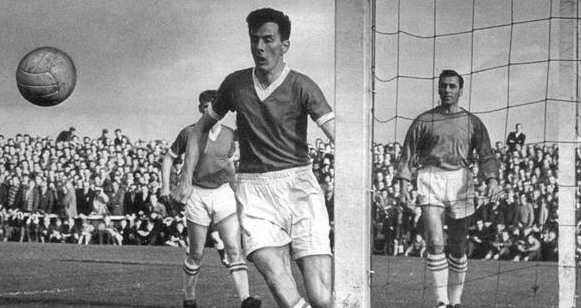 George Neil Farm played for Blackpool throughout their golden decade of the 1950s and winning the FA Cup in 1953. Farm gained 10 full international caps before spending 4 seasons at Queens (3 as player manager). He is the only manager of Dunfermline Athletic who can claim to have surpassed the feats of Jock Stein at the club. George Farm was born in Slateford in Edinburgh on 13th July 1924 and was schooled in Armadale and Bathgate. After playing for Armadale Thistle in junior football, it was at Hibs in their ’famous five’ era of their finest ever side that Farm began his career as a pro in 1947. After a year, and only seven first-team appearances at Easter Road, Farm was on his way. Despite his short stay at Easter Road, team mate and Scotland internationalist, Davie Shaw, later said Farm was the bravest goalkeeper he ever played beside. Farm signed for Blackpool in England’s top division for £2,700 in September 1948. Farm’s time at Blackpool narrowly missed overlapping with Jimmy McIntosh from Dumfries. Like many players of the era McIntosh lost many of his best playing days to World War 2. Despite this McIntosh scored goals in England’s top division for Preston, Blackpool and Everton. McIntosh’s transfer from Blackpool to Everton was in the Summer just before Farm arrived in Lancashire. Englishmen Stanley Matthews and Stan Mortensen and Scots Hughie Kelly, Ewan Fenton and Jackie Mudie were already on the playing staff at Blackpool. The 1950s is the most successful decade in the club’s history to date. Farm is among the small group of players to be at the club playing top division football throughout the decade (right winger Matthews, half back Kelly and forward Mudie are among others in the group). 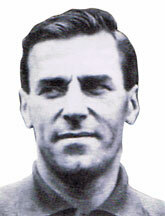 Allan Brown joined from East Fife in 1950 to also serve the club well. Brown later said, "George was a reliable goalkeeper, in whom we had tremendous confidence." As the last line in the defence that became known as ‘the iron curtain’, Farm became the greatest keeper in Blackpool’s history. As well as breaking several appearance records, Farm played in two FA Cup finals. A strapping lad and fearlessly brave, he preferred the unorthodox holding a ball with one hand above and one hand below (as opposed to the more conventional one hand on each side of the ball). Farm was highly dedicated in his art, and was often spotted on the training field long after his team-mates had departed. Always candid and forthright, this included his self assessment. He also continued with his ‘nut cracker’ style of holding the ball. After two reserve games Farm was given his first team debut in a league game for Blackpool on September 18, 1948. At home in a 2-2 draw to Bolton Wanderers, Farm was selected ahead of an out-of-sorts Joe Robinson. Farm kept his place for the 1-0 win over Liverpool the Saturday after, the 3-1 win away to Preston to the week after that, and then another home win against a Merseyside team -3-1versus Everton. And so Farm’s selection continued. Robinson never played in the first team again for Blackpool, as Farm racked up 190 consecutive appearances. Due to receiving his first cap for Scotland, the first game that Farm missed was at Tottenham Hotspur - a 4-0 defeat. Farm also played in all 47 of Blackpool’s FA Cup ties between 1949 and 1960. Farm’s first FA Cup final was in 1951 for the 2-0 defeat by Newcastle (Jackie Milburn hit both goals).Blackpool finished third in the league behind champions Spurs and runners up Manchester United. 1953 saw Farm collect an FA Cup winner’s medal. Arsenal were beaten 2-1 at Higbury in the quarters and then Spurs by the same score in the semi at Villa Park. Then came Blackpool’s finest moment in their history, the 4-3 victory in the "Matthews Final" against Bolton. This is Blackpool’s only major trophy to date. Ironically for such a top class keeper, Farm felt this was the occasion of his worst individual performance, at fault for two goals. England goalkeeper, Gil Merrick, offered him consolation post match in saying Farm had been unlucky. Farm responded, "Nothing of the kind. I just made a mess of them." Goals from keeper’s errors that day were not exclusive to Farm. Bolton’s Stan Hanson was at fault with two goals softer than those conceded by Farm. On October 29, 1955, against Preston North End, Farm injured a shoulder. Unable to continue in goals and in the age before substitutions, Farm replaced Mudie at centre-forward. Farm opened the scoring with a header (the only goal of his career but still more than most goalies). That season with Kelly now club captain, Blackpool finished league runners-up to Manchester United, the highest top division finish in the club’s history. In the eleven seasons that George Farm finished at Blackpool, only twice were they placed lower than ninth. As well as the second and third places listed above, they finished fourth once, sixth once and on three occasions in seventh place. In November 1959 Farm sprang a bombshell to Blackpool - that he and his wife had always planned to return to Scotland and that they felt the time had arrived to move back North. In the same month Farm was given an extended round of applause in the 2-2 home draw against Spurs – Farm had become the first player to make 500 first team appearances for the Seasiders in league and cup. The only other player to make the same achievement, Jimmy Armfield, said of Farm, "He was the most meticulous player I ever met. He was a superb and enormously popular team player." In all Farm made 508 such appearances for Blackpool in 11 ½ years. His time at the club came to an end when he returned to Scotland in February 1960, signing for Queen of the South. Farm’s 10 full Scotland caps included a 3 - 2 victory over West Germany at Hampden Park in 1959. In both games that he played against England he opposed future Queens team-mate, Ivor Broadis. Farm was not part of Scotland´s dismally ill-managed trip to the 1954 FIFA World Cup finals, despite having played in the qualification campaign. Despite Farm’s international career over lapping with two years of that of Willie McNaught, the two never played together in the same international side. With his dedication to fitness and practice, the 35 year old was still a highly capable goalie (only eight months before he had played for Scotland) when signed under manager Jimmy McKinnell junior. Farm’s debut was the 3-3 draw against Hamilton. Farm joined a Queens side that featured two former opponents from his days in England’s top division, Ivor Broadis and Jackie Oakes. Farm went on to make 119 league appearances for Queen of the South, as player-manager in three of his four years with the club from replacing McKinnell as manager in the close season in 1961. On taking over management responsibility Farm wrote an open letter to the Dumfries and Galloway Standard, "My job is to do everything I possibly can, both on the field and off it, to raise our playing standards and produce results that will once again give Queen of the South top class playing status and bring financial benefit to the town and district as well." Farm signed John McTurk and John Rugg for the defence and to supplement the attack he signed winger Willie McLean (Queens manager a decade later) and the Queens player of the 60s to go on to make the biggest mark in football, Neil Martin. This was to add to what he already had - himself in goals, Jim Kerr at the back, winger Ernie Hannigan (at Queens on his way to England’s top tier) and striker Jim Patterson still good for a goal. A late season break through to the first team was the play any position Iain McChesney. Farm had a team worthy of his ambitions for that season - in his first season as player manager, Farm guided Queens back to the Scottish top flight with promotion as Second Division runners-up in 1961-62. Farm’s best moment for Queens playing in goals? The most eye catching to look back upon was his clean sheet on 10 November 1962 to keep Celtic out and chalk up a 1-0 QoS league win at Parkhead (John Murphy scored). Assessed at the time though it was perhaps his three world class saves in the same season (26 January 1963) in the Scottish Cup second round at Willie Waddell managed Kilmarnock – Scottish title runners up that season and champions two seasons later. Goalkeeping credit must also be given to Martin after Farm was carried off with 14 minutes to play against Killie. Queens though held out and indeed won the replay 1-0 to go through. The beat Hamilton 3-0 at home in the next round before Dundee United eliminated Queens after two replays in the quarters. It was in Farm’s time Queens made their second and to date last League Cup semi final appearance in 1960/61 with Maurice Elliott catching the eye. McChesney commented of Farm, “George? Immaculate. George signed me professionally for the Queens. I was on holiday with a couple of my pals, we were just down at Southerness. We were down there for about five or six days. I’d signed as an amateur when I was 15 ½. My 17th birthday came up and George come down, about 10 o‘clock in the morning, I’d just woke up, he came in and said, ‘You’ve signed all the other forms, we’ve got to get this form signed to go to the SFA.’ Of course being daft and stupid I said to him, ‘Oh no, I’m not signing that form before I’ve read it all.’ He just picked me up and said, ‘Don’t be a stupid little beggar, just sign the form, you’ve signed all the rest!’ That was George,” chuckled McChesney. If ever someone needs proof that goalkeeper is the most specialised position on a football pitch, they need look no further than the events at Dens Park in Dundee in December 1962. George Farm was knocked unconscious after 12 minutes from a challenge by Dundee’s Alan Gilzean. Queens had to play the rest of the game a man short and with an outfield player in goals. This was the wrong day for Queens for this to happen. Excellent at that time, the Dundee team bursting with top class players were the reigning Scottish Champions. That season in the European Cup, Dundee knocked out FC Köln, Sporting Lisbon and Anderlecht before losing on aggregate to eventual winners AC Milan in the semis. Taking full advantage of Farm’s absence Dundee ended up 10-2 winners with Gilzean scoring seven. Post match Gilzean made a point of visiting Farm in hospital. This result is the highest defeat in Queens’ history. In January 1964, Farm was sacked. The local press was filled with comments backing Farm and criticising the board. The board however retained him as a player. This was a further oddity as now aged 39, Farm reconised his diminishing effectiveness in goals and dropped himself in December 1963 promptly after Queens signed the young Allan Ball. After Farm’s departure, Queens failed to win a single game in the rest of that season. Farm moved on to considerable success elsewhere. Farm spent the next decade as a club manager in Fife, firstly with three seasons at Raith Rovers. Again Farm and Willie McNaught missed each other. Like Queens, Rovers best decade was the fifties. McNaught is the record appearance holder at Raith with 657 appearances over twenty years. However McNaught left the Kirkcaldy side in 1962. In Farm’s final season at Raith, Farm repeated his achievements at Queens by guiding Rovers to promotion to Scotland’s top division. From 1967 to 1970, George Farm took charge of Dunfermline, winning the Scottish Cup in 1968. The most eye catching result in the cup run was in the first round - a 2-0 win over Jock Stein’s reigning European Cup holders at Celtic Park. Aberdeen were beaten 2-0 in the next round and Hearts 3-1 in the final. In the same season Farm managed the Pars to a fourth place finish in Scotland’s top division. In guiding the Fifers to the semi-finals of the resulting 1969 UEFA Cup Winners’ Cup campaign, APOEL, Olympiacos and West Bromwich Albion were eliminated en route. Dunfermline lost by one goal on aggregate to eventual winners Slovan Bratislava (Slovan beat Barcelona in the final). This is the greatest achievement in Dunfermline’s history, surpassing even that of Jock Stein’s time at the club (with the only other major trophy victory in the Dunfermline’s history, Stein also took the Pars to the Scottish Cup but never progressed with them beyond the last eight in European competition). The same season brought Farm’s highest league finish as a manager - third in Scotland’s top tier. This equals 1965 as the highest league placing in Dunfermline’s history. This brought another European run - Inter-Cities Fairs Cup wins against Bordeaux and Gwardia Warsaw before elimination on away goals to Anderlecht who went on to also eliminate Newcastle United and Internazionale before losing in the final against Arsenal. Farm retired from management after a second three-year spell at Raith Rovers from 1971 until 1974. Enjoying a quiet life in Edinburgh with his wife, Farm was best known then as a commentator and journalist. Radio Forth asked Farm to give candid views and then found themselves surprised with exactly how direct and forth right Farm was. In a complete turn from the world of the beautiful game Farm also had a short time as a lighthouse keeper. In 1988, like many others of Blackpool’s then surviving greats, Farm returned to Bloomfield Road to participate in the club’s celebrations commemorating the centenary of the English Football League.